To extend its production capacity for LED boards and to keep up with the latest technologies in LEDs like the "flip chip" RENA has been exploring the market for machine innovations during 2015. The ideal production line was found in a the smart factory concept from a combination of Partnertec in the Netherlands and ASM Assembly Systems in Germany. In parallel to the machine lead time RENA had to create sufficient space for this 15m long intelligent SMT production line. Various departments had to move internally and even switch to another RENA facility in Zundert. Last May the individual machines arrived and by end of June, in time for our 35-year anniversary, the line was fully operational. 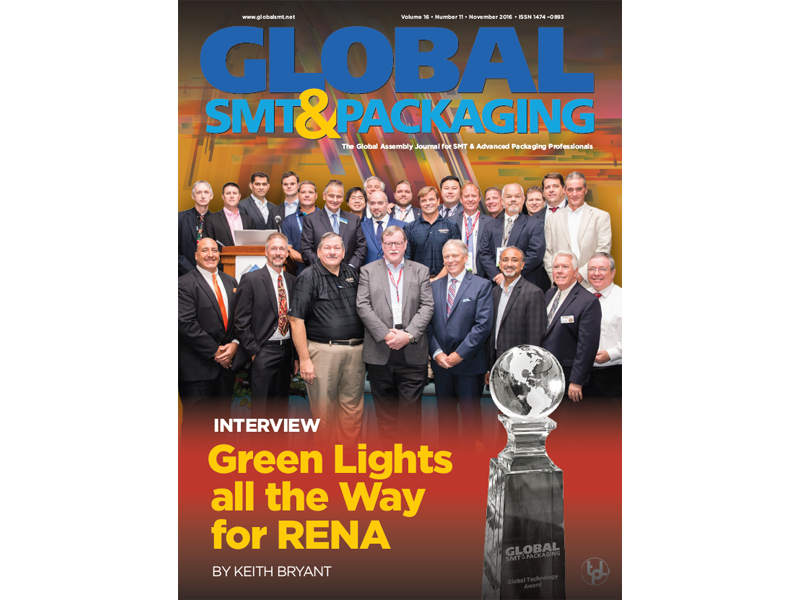 Not only for RENA this was a leap forward into SMT production technology; even internationally this smart factory concept is cutting edge which is proven by the recent publication in the GLOBAL SMT & Packaging magazine. RENA and its new production line feature in a 3-page article by Keith Bryant. Have a look at the article yourself and see the superb equipment we have these days!